You are here: Home › Watching › The Walking Dead: What’s with the structure, season 4? The Walking Dead: What’s with the structure, season 4? Trying to figure out when The Walking Dead returns to finish off season 4? Check out my spring 2014 TV schedule. Potential Walking Dead spoiler! I’m still trying to figure out how I feel about the structure of season 4A. Discuss with me! 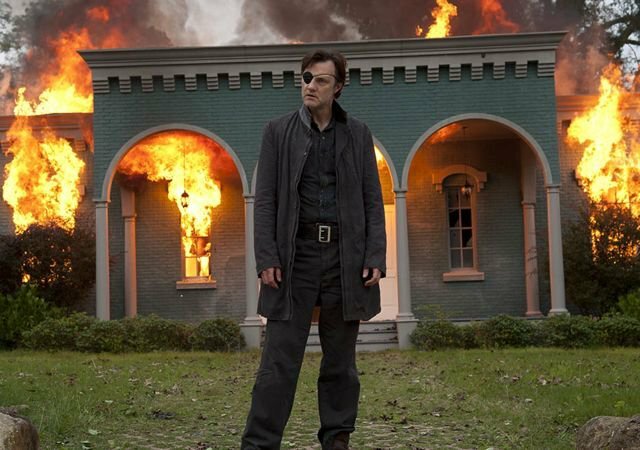 It was nice to see a new side of the governor these last two episodes; I don’t think anyone would dispute that unless they just hate the governor as a character. But was it really necessary to pause the regular, governorless storyline for a two-episode catch-up with him? I mean, it was an intriguing experiment, but does this make the best sense? Episode 7: keep looking at what the governor and his new pals are up to, and keep forgetting the regular cast…until the end! We all knew this was coming anyway, so tonight’s ending was hardly a surprise. My big question is, did taking the focus away from the main storyline for two episodes in a row make (1) those standalone episodes more powerful and (2) the final scene of tonight’s episode, where things come together, more dramatic? Standalone episodes like that can be great, but it struck me as weird having two in a row. Should the writers have condensed it into one? Here’s an option (I’m not saying it’s the best or even a good one, but it’s an option): condense and combine episodes 6 and 7 to form the Walking Dead season 4 premier, all in the governor’s POV. That would lead to 6 episodes with only the regular cast—at least right up until the final scene of episode 7, where we reconnect—and then the typical chaotic finale. It might have even been cool to see that new premier immediately followed by the next episode in a 2-hour premier. Regardless, the bulleted list above is what the writers went with. What did you think? Did it work? Are you still deciding, like me? Comment below, or tweet me!